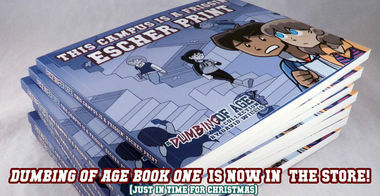 Dumbing of Age Book 1 sample in-hand! I got a two copies each of DoA Book 1 and the Shortpacked! Book 1 reprint from my publisher today. THEY ARE FANTASTIC OH MY GOD. Especially Dumbing of Age. It is the best book I have ever done, ever. I want to lick it. And I probably could. This thing feels waterproof. I can’t wait until I get the full shipment of these in about a month or so, so you can have them, too. 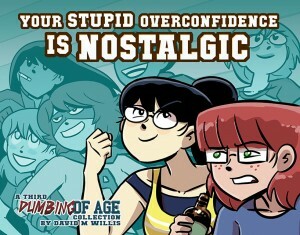 Dumbing of Age Kickstarter funded at $30,030! Man, you guys are super awesome. We had an original goal of $11,000 to print DoA Book 1, passed that in a few days, passed our stretch goal of $20k to reprint Shortpacked! 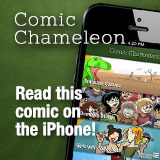 Book 1, and within a second of the end of the Kickstarter, we’d hit $30k. 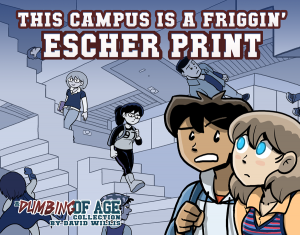 Originally I’d set another stretch goal for $30k, promising to print Roomies! 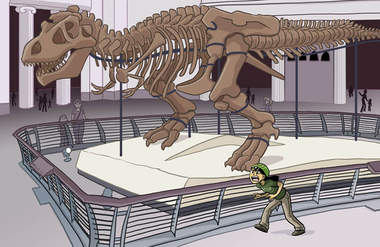 Book 2 if that happened, but a few days ago I realized I’d gotten soooo many pledges I needed to print more books, and would have to cannibalize some of those funds to print more. But since we passed $30 anyway, I’ll see how much money I have after the dust settles (you know, Kickstarter fees, Amazon payment fees, taxes) and see if we can’t do it anyway. I’ll keep you posted. There was a very sweet moment, like 4 minutes until the end of the Kickstarter period, where we had 666 backers. And then some jerks had to ruin it by giving me more money! Oh well. But wow. 670 backers. Last year’s Kickstarter for Shortpacked! Book 4 only had about 250 backers. This, uh, kind of triples the amount of books I’ve ever sent out, ever. This will be daunting. Please have patience with me once these books arrive in my possession, for I am but one dude, and you are legion. Time to gather your names and submit the final DoA book PDF for printing! We have done good.